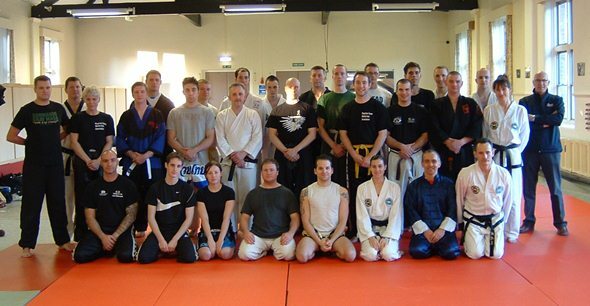 On December the 18th 2008 SiFu Dale was invited to give a seminar to the RAF Martial arts team, 25 members spent the afternoon covering combat aplications based on traditional chinese martial arts, body mechanics and power generation, applications. The seminar was well received by all who attended, with many positive comments made. On a decidedly chilly December 17th 2008 at Royal Air Force Halton in Buckinghamshire, the Royal Air Force’s Martial Arts Association were privileged to host SiFu Julian Dale, to introduce Eagle Claw Kung-Fu to our martial arts practitioners, who cover a wide spectrum of disciplines and grades. This initiative is part of an ongoing effort to broaden the experience of martial artists within the Royal Air Force. Over the space of 3 hours in the afternoon, Si-Fu Dale introduced us to a range of applications and techniques designed to illustrate the concepts and complete martial approach that appears to typify Eagle Claw Kung Fu. It was a fascinating insight into a martial system that was wholly unfamiliar to the majority of the Royal Air Force’s martial artists; the internal and external principles demonstrated were very illuminating. We were profoundly grateful to both Si-fu Dale and his student, who very willingly received the SiFu’s techniques for our benefit and also aided in instructing us and demonstrating a form. It was particularly interesting to see the contrast between the sports orientated systems that the majority of us practice and Eagle Claw’s entirely martial approach and we are all the richer for the experience. All in all, this was an excellent opportunity to see an original martial system demonstrated in an excellent and entirely sympathetic way by Si-Fu Dale and his colleague, rounding off a superb year for us in true style.